The chaos game, previously seen on Frank Noschese’s 180 blog and Jonathan Clayton’s blog Infinite Sums. Check it out live. All these live links will probably work great on your smartphone too. Source code. Random Triangle Chaos game. 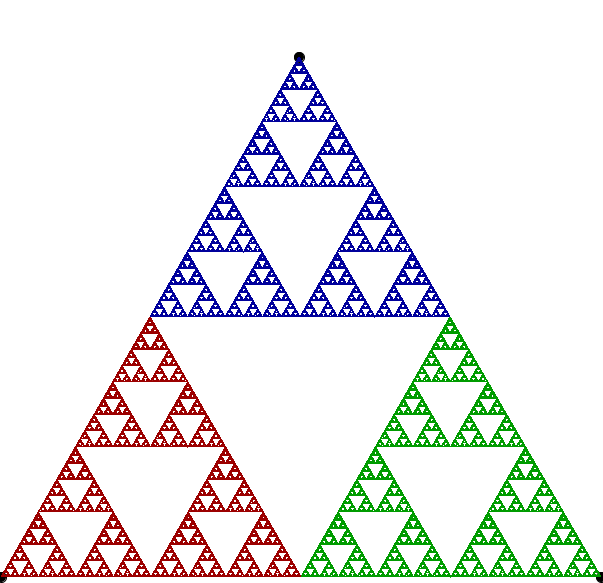 Click to set a new random triangle. Source code. Square Chaos game. Any key to refresh. Left click to “zoom out”. Right click to “zoom in”. Source code. Square Chaos game version 2. Any key to refresh. Left click to “zoom out”. Right click to “zoom in”. Source code. Pentagon Chaos game. Any key to refresh. Left click to “zoom out”. Right click to “zoom in”. Source code. Can you create any modifications from this source code? Getting started is relatively easy: download processing 2.0.1, paste the source code in and press run. Note: Thanks to the Math open reference for an applet to calculate the vertex coordinates for the hexagon and pentagon and saving me a little time.